Still from Gropius Memory Palace (2017), 4K video; 5.1 sound; 20:17 min. Gropius Memory Palace (2017) is a portrait of the Fagus Factory in Alfeld, Germany, one of the earliest designs of Bauhaus architect Walter Gropius. 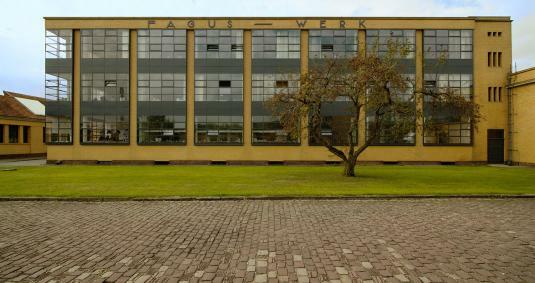 The Fagus Factory opened in 1913 and remains in operation, continuing to make shoe lasts (wooden or plastic molds used in constructing shoes). It is also a UNESCO World Heritage Site and museum. Following the screening, filmmaker Ben Thorp Brown will discuss the project with Laura Muir, curator of The Bauhaus and Harvard exhibition and research curator for academic and public programs at the Harvard Art Museums. Ben Thorp Brown works across video, sculpture, and performance. His projects consider the effects of economic, environmental, and technological change. Recent work has been presented in exhibitions at the Saint Louis Art Museum; Dreamlands: Immersive Cinema and Art, 1905–2016 at the Whitney Museum of American Art; Greater New York at MoMA PS1; 24/7 the human condition at the Vienna Biennale; and In Practice: Chance Motives at the SculptureCenter. He received a B.A. from Williams College and an M.F.A. from the School of the Art Institute of Chicago and attended the Independent Study Program of the Whitney Museum. He currently teaches in the B.F.A. and M.F.A. programs at Parsons/The New School and has received awards from Creative Capital and the Graham Foundation to support upcoming work. This program is presented in conjunction with our special exhibition, The Bauhaus and Harvard, on view February 8–July 28, 2019. The screening will take place in Menschel Hall, Lower Level. Please enter the museums via the entrance on Broadway. Doors will open at 2:30pm. Free admission, but limited seating is available on a first-come, first-served basis.